Free laundry, how great! The sites are outstanding! Would like to have stayed longer but had to travel. Great sightseeing area. Sounded like a lot of brass stays there because they keep the best sites just in case. But we did like it and it is easy access. Have one thing to add (point out) not covered in earlier reviews. When they say $15 a day and $72 a week they mean it. We paid 15x5=$75 to stay for five days and would have had to pay an additional $15 to extend a day. Yes, it costs less to stay for seven days than it does for five or six days. Lack of a community room and particularly a bathhouse are the reasons for my low Facilities rating. Visited in July. 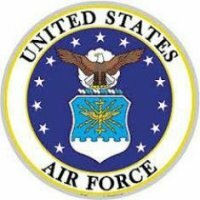 Has aircraft noise, but that is expected with active AFB. Sites were nice level pull thrus with dividers between. Wide enough for slides. Across from park for dogs and children. Walking distance to BX and Commissary. Enjoyable location with vegetation. Very good famcamp. Laundry machines are FREE, no showers, concrete pads, cable, excellent cell reception. Only negative - located VERY close to the flight line and Monday thru Friday it is BUSY!! Not much to do as we have no interest in visting Mexico but the town of Del Rio is nice enough. Lots of shopping, Seminole Canyon SP is 40-45 miles away, other historical sites near. Lots of birding, biking on base. I would definitely come back to the famcamp IF we are in the area but will not make this a destination famcamp due to the lack of off-base activities. This famcamp has few amenities but has exactly what a traveler needs -- good long, easy in and out, pull throughs and E/W/S/Cable for $15 a night. Friendly camphost, decent base golf course, and town not too far away made this a perfect stop for a few nights as we headed back north from the Valley. Airplane noise during the day was non-stop and shade is sparse, but the privacy fence and picnic tables made each site very comfortable. We would return. Someone mentioned in a previous review that 1/2 of the spaces are first come, but that is not really true anymore. Spaces 11-21 are for reservations, spaces 9 and 10 have FEMA trailers in them, spaces 5 through 8 are for active duty long termers only, so that leaves spaces 1-4 as first come. That really shouldn't be a problem as there are usually plenty of empty spaces available anytime except during the winter months. It is a well maintained campground with a free laundry just for the famcamp, although it is not within walking distance. Since Laughlin is a small base, everything is close by. One complaint about this campground is the lack of shade. 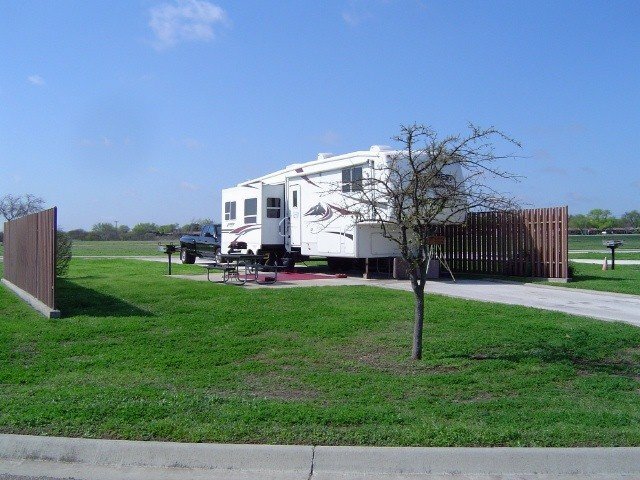 This is a great RV Park ... huge sites, well kept grounds, friendly host, easy to locate and convenient location on base. The only downfall in our mind was the restroom facilities. They are located in an adjacent park area, convenient enough, but I don't think they had been cleaned for weeks. Trash on the floors, no toilet paper, bee's nests in the stalls, floors not washed/cleaned for a long time. I mentioned it to Outdoor Rec, who indicated they had been having trouble with the contractor ... that was obvious ... but even after mentioning it, nothing seemed to happen. With that exception, this is a wonderful RV Park. Campground was not full so we had a choice of sites. All long, pull-thrus with full hook-ups & privacy fencing. Well-kept playground surrounded by white picket fence - quiet & peaceful. Got used to hearing reveille, the National Anthem & taps. BX is kitty-corner convenient. Nearby town of Del Rio is handy for additional shopping & dining choices. Don't miss touring some of the Amistad Rec. Areas - stop by their Visitor Center to view the brief but informative film. Consider visiting their "Sister City" in Mexico - Ciudad Acuna. We parked our car in a lot right at the border crossing, paid 75 cents bridge toll & walked across to take advantage of inexpensive dental care (per a friend's referral). Only cost us 30 cents a piece to return and our DL IDs but Passports will be required in future. Great value @ $72/week. We didn't require outside bath/shower facilities altho we appreciate them when available. We recommend this campground to others and would return ourselves. As of Feb 2008 - the Main gate off Hwy 90 is open. All construction completed. No problem making the barricade. (we pull a 26' TT) Keith, the host, met us and made us feel right at home. Easy access to all pull-thru's. 60+ cable TV free stations, Wi-fi avail 200 yds away in the beautiful,main lodging building, or use their computers. The base library has internet computers too. BX is 100 yds away. Nearby park for the kids. My only complaint is the bath-house. There isn't one. We are able and competent (ha !) to use our showers but I really like using somebody else's hot water I guess. Keeps my holding tanks from filling up too fast also. But other than this- we really loved it. The base is dead quiet on wk ends (no UPT flying). We crossed over into Cuidad Acuna on Sat. & had a wonderful time. Beautiful people and good deals. E-mail me for any more info desired on visiting Mexico from Laughlin AFB, pls. Sat. nite was Tops in Blue at Laughlin. So you know how great that was...We want to return-immediately. If we weren't heading to Arizona, we would stay.